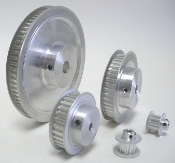 10XL037 0.25" Bore Aluminum Timing Pulley with 2 Flanges, Hub and 2 Set Screws, Pitch Dia = 0.637". Outside Dia. = 0.617"
AOL Length Through Bore: 0.78"